Located about an hour and a half east of Palm Springs (and about three hours east of Los Angeles in good traffic conditions), Joshua Tree National Park includes two deserts — the higher Mojave Desert and the lower Colorado Desert — each of which supports an ecosystem indicative of its elevation. The tree from which this California National Park takes its name – the Joshua Tree (or Yucca Brevifolia) – was so-named by early Mormon emigrants who thought their outstretched branches resembled supplicating arms of the biblical prophet, Joshua. The tree is abundant in the park’s higher, slightly cooler Mojave Desert area. Joshua Tree National Park is a popular destination for hikers, cyclists, horseback riders, rock climbers and bird watchers. Rock climbing enthusiasts are particularly intrigued by the geologically unique landscape, featuring hills of bare rock formed from magma that cooled over 100 million years ago. Spring is a favorite time to visit, when the Yuccas and numerous wildflowers add a vibrant and panoramic splash of color to the otherwise stark desert environs. The Joshua Trees are usually the first to bloom (around late February), followed by an array of annuals sometime in March. Cacti usually follow suit and flower in April or May. Spring is also an excellent time for bird-watchers to plan a visit to the park. Spring (and fall) high/low temperatures average 85/50 degrees Fahrenheit, respectively, but summer daytime highs often exceed 100 degrees. If you plan to visit during summer months, prepare accordingly. Winter brings cooler days (around 60-degree highs), freezing nights and occasional snow at higher elevations. Keys View, named after desert loner Bill Keys (who, interestingly, was successfully defended by Perry Mason author and lawyer Erle Stanley Gardner in a notorious 1940s murder trial), offers a 360-degree summit view of the Salton Sea, Mexico and the San Gorgonia and San Jacinto Mountains. It is an ideal spot to enjoy a sunset any time of the year. The Joshua Tree National Park visitor center is located at the park’s east entrance (74485 National Park Drive, Twentynine Palms, CA 92277; 760-367-5500). 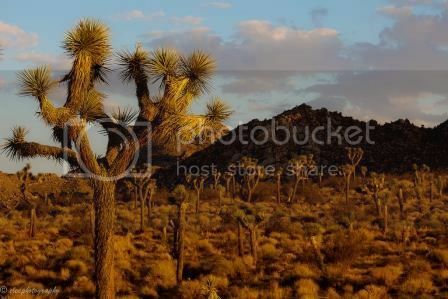 Photo of Joshua Tree National Park by Esther Lee via flickr (Creative Commons).